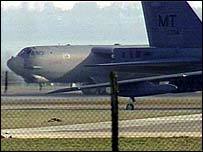 The cost of policing an RAF base used to launch B-52 bombers during the Iraq war was almost £8m, the BBC can reveal. RAF Fairford in Gloucestershire was the scene of several demonstrations leading up to the war, with forces from around England involved in policing them. From 2002 to 2004, the police operation cost £7.79m, including £89,000 on costs including prisoner maintenance. On Wednesday, anti-war campaigners won a legal battle to prove their rights to protest were violated near the base. Law Lords ruled police violated the right to freedom of expression and lawful assembly after detaining a group of 120 protesters in their coaches in March 2003. Gloucestershire Police said it was "disappointed" with the decision, and that officers acted in "good faith". The High Court and Court of Appeal had already ruled that police acted unlawfully in holding the demonstrators on the coaches. Figures released under the Freedom of Information Act, and seen by the BBC, show that £6.7m was spent over the two years on overtime and on police support units from other forces. Gloucestershire Police, which led the operation, spent £374,000 - 0.5% of its net revenue budget for 2002/03. The rest of the money came from a Home Office grant. Jessie Schust, one of the protesters, told BBC News the amount of money spent was "terrible" and that the group was considering seeking compensation from the police after the Lords' ruling. "The policing could have been done with [less money] and creating a better relationship between protesters and the police." A Gloucestershire Police spokesman said: "The policing operation at RAF Fairford, which lasted several months, was extremely successful. "It balanced the needs of the military establishment at a time of conflict and those of members of the public keen to exercise their right to demonstrate against military action. "During the lifespan of the operation Gloucestershire Police, with the support of colleagues from several other forces, were able to maintain the security and integrity of the base's 13.5 mile perimeter fence with minimal disruption to military personnel working at RAF Fairford. "At the same time police actions made it possible for thousands of people to protest peacefully outside the base."